Last year, four million motorcycles were in use in the United States alone. Whether relied upon as a primary means of transportation, used to provide weekend recreation, souped up and sped along for racing, or displayed as antique, millions of people across the world have shown that the novelty most definitely has not worn off. As might be imagined, the motorcycle evolved from a vehicle powered by sheer human energy—the bicycle. French bicycle maker Pierre Michaux and his sons Ernest and Henri first fitted a bicycle with cranks and pedals—precursors to the modern-day motor—in 1861. The Michauxes' velocipede was an instant hit and the family became the largest velo producer in Europe with a large factory at Bar-le-Duc in France. Working with Michaux, L.G. Perreaux devised a steam-powered motorcycle engine, called a velo-a-vapeur, which was patented in 1868. Sylvester Howard Roper of Roxbury, Massachusetts pioneered a similar invention in the United States around that time as well. In 1879, Giuseppe Munigotti of Italy patented the first gas-burning internal combustion four-stroke engine for the new motorcycles, although his invention existed only on paper. Meanwhile, two Germans, Dr. Nicolaus Otto and Eugen Langen were developing four-stroke stationary engines, which ran on coal gas supplied from mains. Gottlieb Daimler took the invention further by developing an engine that ran on benzine. Since benzine could carry a vehicle approximately 25 miles on one gallon, only a small tank would need to be attached to the machine. Daimler later abandoned the motorcycle business to concentrate on another invention—the first automobile that became the basis for his company, Daimler Benz, maker of the luxury Mercedes Benz automobile. Several innovators improved upon these inventions over the next 30 years, and in 1901 the machine that is still regarded as Carl Hedstrom, a Swedish immigrant to the United States, developed the first modern motorcycle. Hedstrom fitted an Indian bicycle with a 1.75-horsepower single-cylinder engine, and the legendary Indian motorcycle was born. Several other U.S. makers came out with similar models, including the company whose name is synonymous with the motorcycle—Harley-Davidson—in 1903. William Harley and Arthur Davidson were students in Milwaukee when they built their first motorcycle on a borrowed lathe from patterns they had made. Davidson's older brothers, both toolmakers, assisted, as did Ole Evinrude, who later became famous as a designer and producer of outboard motor boat engines. Other makers included Royal, Merkel, Yale, Reading-Standard, Rambler, Tribune and Curtiss. By 1904, motorcycle manufacturers had begun to construct bulkier, sturdier frames, stronger wheels, bigger engines and reinforced forks for their bikes and a clear distinction between motorcycles and bicycles emerged. Around this time, the sidecar, affixed to a light, tubular frame extending from the main motorcycle frame, began to be popularized. Based on a similar accessory for the bicycle, his device allowed the driver of a motorcycle to carry a passenger. By 1905, the focus was on power, and manufacturers begin to beef up their engines. That year, Hedstrom produced a machine boasting a 500 cc twin engine that featured twist-grip control for the throttle and ignition. That same year saw the development of "free engine" devices, which eased the starting and launching of a machine, and variable gears, which eased use on hills and at slow speeds. Chain drive followed, and the stage was set for production of the motorcycle that is currently in use. Motorcycles continued to grow in popularity for decades, although production for civilians tapered off during World War II. During World War II, however, a need arose for lightweight, collapsible models to be used by parachutists once they had landed. Royal Enfield produced a Flying Flea model for this purpose, while Excelsior came up with its Welbike, which could fit into a small air-drop container. The Welbike was later marketed to civilians as the Corgi, spawning the post-war popularity of the motor scooter, especially in Europe. The 1950s were regarded as a "golden age" for the motorcycle, with its use being popularized by such prominent figures in popular culture as James Dean in his movie "Rebel Without a Cause." The United States and Europe dominated the motorcycle industry through 1960, at which time Japanese manufacturers, including Honda, Yamaha, Suzuki and Kawasaki, rose to a prominence they maintain to this day. An Indian motor-cycle made by Hendee Manufacturing Co. of Springfield, Massachusetts, circa 1911. 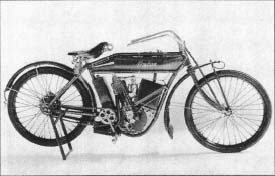 The Europeans took the lead in developing the motorcycle in the early twentieth century. One Englishman proclaimed his countrymen loved the cycle because they enjoyed mechanical things. However, Americans enjoyed their motorcycles as well. An American gentleman could have purchased this home-grown motorcycle manufactured in 1911 by the Hendee Manufacturing Co. of Springfield, Massachusetts. Hendee made early American motorcycles, which featured Native American names indicating a proud ruggedness. Red with gold striping, this one cylinder 3.5 horesepower loop-framed cycle weighs 140 lb (63.6 kg), has a wheel diameter of 23.5 in (59.7 cm) and cost a whopping $225.00 back in 1911. Founded in 1901, the company ceased operation in 1953. However, Indian motorcycles are still beloved—enthusiasts claim that there are still 50,000 Indian motorcycles on the road. Indian bikes might reach 60 m.p.h., but handbooks cautioned riders to not exceed 10 m.p.h. through town. These early handbooks are full of advice and etiquette for the motorcyclist. Some period gems include: don't ride with the muffler open as "the noise scares restive horses, and worries invalids and nervous people," don't run away in case of accident but "stand by like a man … don't get rattled," and don't ride by a motorcyclist who is stalled by the side of the rode as "you may be in the same fix yourself some day." electrical system contains a battery, ignition wires and coils, diodes, spark plugs, head-lamps and taillights, turn signals and a horn. A cylindrical piston, made of aluminum alloy (preferred because it is lightweight and conducts heat well), is an essential component of the engine. It is fitted with piston rings made of cast iron. The crankshaft and crankcase are made of aluminum. 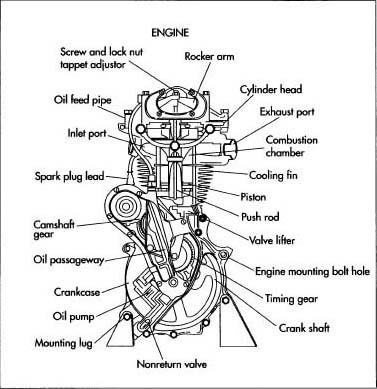 The engine also contains a cylinder barrel, typically made of cast iron or light alloy. Raw materials as well as parts and components arrive at the manufacturing plant by truck or rail, typically on a daily basis. As part of the just-in-time delivery system on which many plants are scheduled, the materials and parts are delivered at the place where they are used or installed. Manufacturing begins in the weld department with computer-controlled fabrication of the frame from high strength frame materials. Components are formed out of tubular metal and/or hollow metal shells fashioned from sheet metal. The various sections are welded together. This process involves manual, automatic, and robotic equipment. In the plastics department, small plastic resin pellets are melted and injected into molds under high pressure to form various plastic body trim parts. This process is known as injection molding. Plastic and metal parts and components are painted in booths in the paint department using a process known as powder-coating (this is the same process by which automobiles are painted). A powder-coating apparatus works like a large spray-painter, dispersing paint through a pressurized system evenly across the metal frame. Painted parts are sent via overhead conveyors or tow motor (similar to a ski lift tow rope) to the assembly department where they are installed on the frame of the motorcycle. The engine is mounted in the painted frame, and various other components are fitted as the motorcycle is sent down the assembly line. 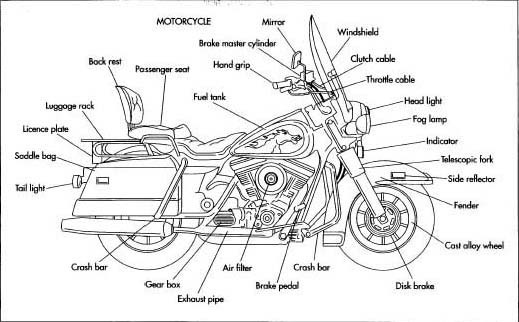 Wheels, brakes, wiring cables, foot pegs, exhaust pipes, seats, saddlebags, lights, radios, and hundreds of other parts are installed on the motorcycle frame. A Honda Gold Wing motorcycle, for example, needs almost as many parts to complete it as a Honda Civic automobile. At the end of the assembly line, quality control inspectors undertake a visual inspection of the motorcycle's painted finish and fit of parts. The quality control inspectors also feel the motorcycles with gloved hands to detect any bumps or defects in the finish. Each motorcycle is tested on a dynamometer. Inspectors accelerate the motorcycle from 0-60 mph. During the acceleration, the "dyno" tests for acceleration and braking, shifting, wheel alignment, headlight and taillight alignment and function, horn function, and exhaust emissions. The finished product must meet international standards for performance and safety. After the dyno test, a final inspection is made of the completed motorcycle. The motorcycles are boxed in crates and shipped to customers across North America and around the world. 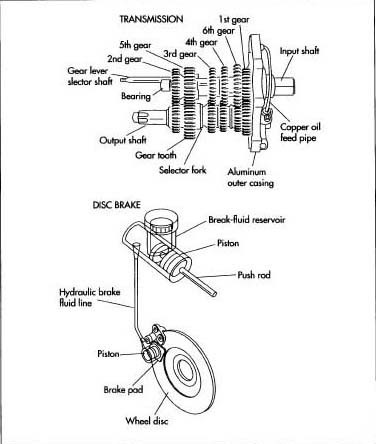 A motorcycle transmission and disc brake system. it is anticipated that the value of older models will continue to rise. Ayton, Cyril, Bob Holliday, Cyril Posthumus and Mike Winfield. The History of Motorcycling. London: Orbis Publishing, 1979. Lear, George and Lynn S. Mosher, Motorcycle Mechanics. Englewood Cliffs, NJ: Prentice Hall, 1997. Hello thanks so very much. I have had to do a schol task and I chose to do Motorbikes and its been a struggle trying to get information about how it works and all of that. This has helped me extremly.